The day after high school graduation in 1987, Bill Schmoker, a Lakewood, Colorado, native, and his friend headed to Alaska. They spent the summer fishing and hiking and even drove the Dalton Highway to Prudhoe Bay where they saw the Arctic Ocean for the first time. Twenty-three years later, Schmoker saw the Arctic again from a completely different perspective. 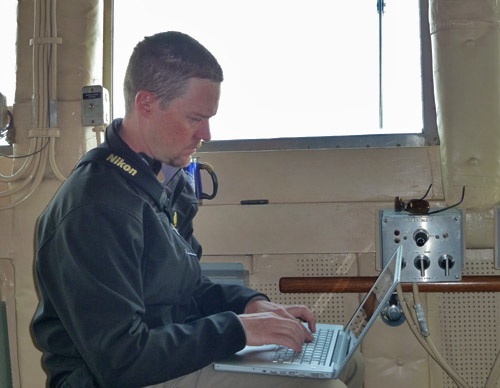 As part of PolarTREC, an NSF-funded program which pairs K-12 teachers with polar field science projects, Schmoker spent five weeks aboard the 420-foot U.S. Coast Guard Cutter Healy. Not only is the Healy the largest and most technologically advanced ship in the Coast Guard fleet, but her ice-breaking capabilities are what made the Healy an essential vessel for this summer’s science mission. The Healy maps the seafloor using a variety of sonar instrumentation while breaking ice for the Canadian Coast Guard ship, the Louis S. St-Laurent, which maps the seafloor subsurface using a towed seismic reflection system. This was the third year of the International Continental Shelf Survey, an ongoing joint effort between the U.S. and Canada to map the sea floor in the Beaufort Sea north of Alaska and Canada. The countries are working together to collect data that will help each verify where they have natural resource rights in the Canada Basin under the United Nations Convention on the Law of the Sea, which spells out how countries define their ocean boundaries. One of Schmoker’s many roles aboard the Healy was that of watchstander. During a daily four-hour shift he and another shipmate, along with one of the chief scientists from the United States Geological Survey, manned a station surrounded by monitors displaying data from the ship’s navigational and sonar systems – instrumentation crucial to the success of the science mission. 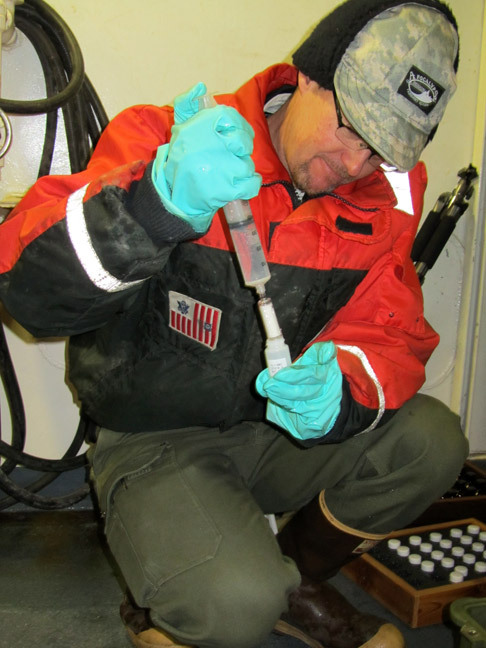 When not on watch, Schmoker joined the water sampling team, collecting and cataloging samples from a CTD (conductivity, temperature, depth) rosette which collects water samples at different depths as it is lowered to the sea floor. He also helped out with ice observations, coring operations, attended twenty ship-board science lectures, and talked with students via satellite phone. Down-time activities like Saturday night movie night in the Healy’s helicopter hangar, bingo, and helping to cook pizza on science crew cooks night, helped Schmoker feel at home during his five weeks at sea. Now in his 18th year of teaching, Schmoker found his at-sea experience a perfect melding of earth science and biology, the two courses he teaches at Centennial Middle School in Boulder, Colorado. An avid birder and bird photographer, Schmoker had plenty of first time experiences during his trip. He’s ready to share his adventures with his classes through lesson plans and curriculum development. And he’ll be telling everyone he can about everything he’s done and seen.